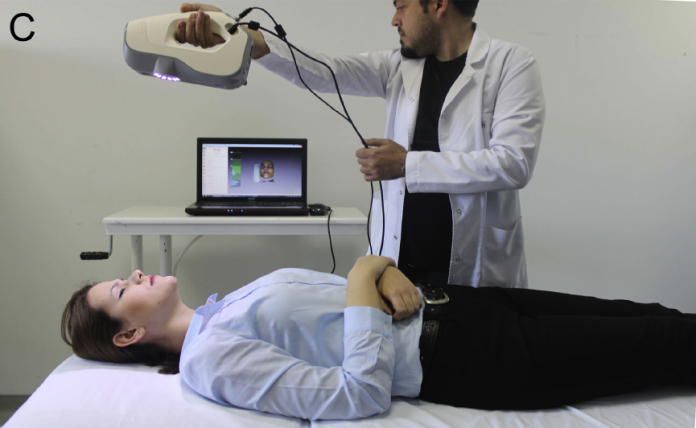 In a recent study at Akdeniz University in Antalya, Turkey, Artec’s Eva 3D scanner was instrumental in the innovation of a highly accurate method of tracking the behavior of human facial soft tissues depending on the position of the body. For years, medical experts have relied upon conventional techniques of cephalometry to study the proportions of the head and face. Among the staples of scanning solutions are magnetic resonance imaging (MRI), computer tomography (CT) and cone beam computed tomography (CBCT). But as a study by Turkish experts from Akdeniz University points out, the results from traditional approaches can be rife with inaccuracies. When the biometric data are taken from each of the methods, then combined and analyzed in clinical practice, measurement discrepancies emerge. Yet they are seldom factored in, creating a veritable medical Pandora’s box. 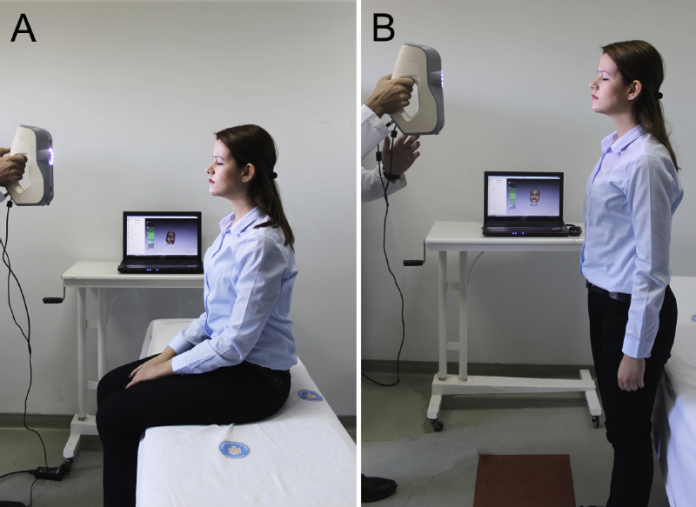 Paired up in the study against the likes of MRIs and CBCTs, Artec Eva structured-light 3D scanner, purchased by the University from Artec’s Turkish partner Teknodizayn, proved path-breaking in minimizing measurement discrepancies. Its portable and flexible design allowed it to work around the limitations that traditional techniques face. Unlike Eva, current medical technology requires the patient to remain standing, sitting, or lying down in order to render biometric data. Such imposition on the patient and limitation on the practitioner are virtually eliminated if Eva is used instead. Being able to scan from virtually any angle ups the volume of data that can be collected, which, when examined as a whole by medical practitioners, leads to results of superior precision and reliability. In the study titled, “Effect of Sitting, Standing, and Supine Positions on Facial Soft Tissue: Detailed 3D Analysis,” members of the University’s Department of Anatomy, Faculty of Medicine, U. Ozsoy, R. Sekerci, and E. Ogut addressed a few crucial questions that pertain to both biological tissue displacement and medical imaging methods. What changes can be detected in the position of facial soft tissues across variations in the position of the body? And what relevance do these shifts have on medical analyses and procedures? Firstly, the experimenters sought to investigate the behavioral complexity of human facial soft tissues. In particular, they focused on the tissue’s degree of displacement with respect to three positions of the body during scanning: standing, sitting, and supine. What changes can be detected in the position of facial soft tissues across variations in the position of the body? And what relevance do these shifts have on medical analyses and procedures? The second, perhaps, most important inquiry of the study tackles the root of the problem that many practicing medical experts invariably encounter: method. Standard techniques of facial measurement are hampered by external factors apropos to the method of choice. In sensitive procedures that require accurate data on facial soft tissues, the capacity to minimize if not entirely eliminate the effect of external factors determines the method’s degree of reliability. The study done by Turkish experts identifies gravity as a contributing factor. The study done by Turkish experts identifies gravity as a contributing factor. Though it exerts force upon the body, its significance is by most intents and purposes insignificant. But when it comes to human facial soft tissues, gravity can have an enormous impact. The study thus arose from the assumption that the data rendered by current scanning methods must be analyzed in light of the variability of change that gravitational forces can create due to changes in the position of the body being scanned. To study gravity’s remarkable effect on human facial soft tissues, the researchers formed a test group of 35 women and 35 men ranging in age between 19 and 24. To determine to what extent gravity displaces and alters the shape and volume of facial soft tissue, depending on the body’s position, it had to be tracked in some fashion. 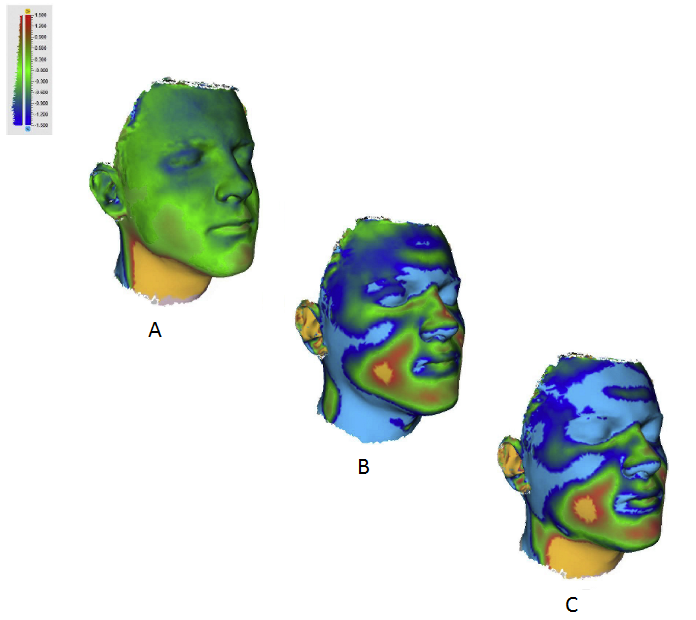 Using a pen, the experimenters dotted out 35 points directly on the face of each participant as a way of segmenting its surface area. The scientists referred to them as “landmarks.” With the surface of the face neatly “mapped out,” the medical team could then monitor their changes across scans of the patient’s head at varying positions. Eva performed with a precision level of up to 0.1 mm and a 3D resolution of up to 0.5 mm. These numbers played key roles in providing answers to the fundamental questions posed by the study. Once the 3D images had been obtained and uploaded into Artec Studio, the scan set for each position underwent manual alignment. The scientists needed to find a way to line up the facial scan set that belonged to each patient. They relied therefore on the so-called mid-endocanthion point. Said to be “the statistically most stable point of the face,” it is located in the space between the inner corners of the eyes. This helped the scientists anchor the x, y, and z axes, designations which corresponded respectively to the transverse, vertical, and sagittal planes of the head. Once all the points had been coordinated to compile a digital “facial mask,” the experimenters made use of the surface mapping algorithm in Artec Studio to merge the scan set. The landmarks brought the scans uniformly into a single position and orientation. Now the experts could track the differences in displacement between the sitting, standing, and supine positions by analyzing the x, y, and z axes. The facial masks were digitally superimposed in order to display the landmark shifts indicating changes in the tissue’s position and parameters. Mask to mask deviation color maps derived from the superimposition of facial masks in (A) the sitting and standing body positions, (B) the sitting and supine body positions, and (C) the standing and supine body positions. The map changes in color from blue, which corresponds to negative distance, to red, which corresponds to positive distance; green means that the distance between surfaces at that particular point is close to zero. With the aid of GraphPad Prism version 6.05, the scientists began to carry out the necessary statistical analysis. The landmarks had to be examined for standard deviations (SD) to quantify the surface displacements. Meanwhile, such relevant numerical data as the root mean square (RMS), the mean absolute deviation (MAD), and the mean signed distance (MSD) values were also calculated in order to determine “the variability in shape and volume of the surfaces.” This provided the scientists with numerical proof of the facial soft tissue transformations that gravitational forces shape, but medical scanning equipment inadequately detect. 3D analysis of the facial soft tissue revealed significant differences between the sitting-supine and the standing-supine positions. In contrast, when comparing the sitting position to the standing position, the difference was very limited along all axes. Furthermore, analyses of the landmarks showed different susceptibilities of each landmark to the body position. The scope of application of the experiment extends to medical consultation and practice, in particular though not exclusive to the field of oral and maxillofacial surgery. The scope of application of the experiment extends to medical consultation and practice, in particular though not exclusive to the field of oral and maxillofacial surgery, where the tiniest miscalculation can result in a mistake of enormous, damaging proportions. Thus, accurate assessment of facial soft tissues in pre- and post-operational examinations can directly affect the overall result.